The main characters of the novel are Florentino Ariza and Fermina Daza. Florentino and Fermina fall in love in their youth. A secret relationship blossoms between the two with the help of Fermina’s Aunt Escolástica. They exchange several love letters. However, once Fermina’s father, Lorenzo Daza, finds out about the two, he forces his daughter to stop seeing Florentino immediately. When she refuses, he and his daughter move in with his deceased wife’s family in another city. Regardless of the distance, Fermina and Florentino continue to communicate via telegraph. However, upon her return, Fermina realizes that her relationship with Florentino was nothing but a dream since they are practically strangers; she breaks off her engagement to Florentino and returns all his letters. A young and accomplished national hero, Dr. Juvenal Urbino, meets Fermina and begins to court her. Despite her initial dislike of Urbino, Fermina gives in to her father’s persuasion and the security and wealth Urbino offers, and they wed. Urbino is a medical doctor devoted to science, modernity, and “order and progress”. He is committed to the eradication of cholera and to the promotion of public works. He is a rational man whose life is organized precisely and who greatly values his importance and reputation in society. He is a herald of progress and modernization. Even after Fermina’s engagement and marriage, Florentino swore to stay faithful and wait for her. However, his promiscuity gets the better of him. Even with all the women he is with, he makes sure that Fermina will never find out. Meanwhile, Fermina and Urbino grow old together, going through happy years and unhappy ones and experiencing all the reality of marriage. At an elderly age, Urbino attempts to get his pet parrot out of his mango tree, only to fall off the ladder he was standing on and die. After the funeral, Florentino proclaims his love for Fermina once again and tells her he has stayed faithful to her all these years. Hesitant at first because she is only recently widowed, and finds his advances untoward, Fermina eventually gives him a second chance. They attempt a life together, having lived two lives separately for over five decades. Urbino’s function in the novel is to contrast with Florentino and his archaic and boldly romantic love. Urbino proves in the end not to have been an entirely faithful husband, confessing one affair to Fermina many years into their marriage. Though the novel seems to suggest that Urbino’s love for Fermina was never as spiritually chaste as Florentino’s was, it also complicates Florentino’s devotion by cataloging his many trysts as well as a few potentially genuine loves. By the end of the book, Fermina comes to recognize Florentino’s wisdom and maturity, and their love is allowed to blossom during their old age. I can see why Gabriel Garcia Marquez won the Nobel Prize for literature. The book has a very unique style. It is more like painting a picture with words than telling a story in the usual sense. In a painting you can move your focus, look around and see different parts quickly, then maybe study some details. Similarly, the scenes in the book are not in chronological order. In fact, the first scene is actually near the end temporally (so don’t worry that the next paragraph of this review is giving anything away, you will find these things near the beginning of the book). The author gives a glimpse of various points in time, and then fills in details as the book progresses. And, it is more than just a picture of these characters’ lives, it is a picture of a time and a place. At the end of the book, you will feel like you have lived there. For most of the book, I thought it was a tragedy not a love story. I disagree with many reviewers, it was not a book about unrequited love, because Florentino Ariza was never in love. Even though Florentino Ariza was successful in a worldly sense, I felt sorry for him. He never loved Fermina Daza, they were never much more than acquaintances. He wasted his entire life being in love with the idea of being in love, but never understanding what love is. Love is not a disease, it is not infatuation, it is not lust, it is not an extreme form of like. For most of his life, his love was about himself, even when he was proud to be suffering for it. Only at the very end did he realize that love is about the one being loved, it is something you do; love is a verb, not a state of being. Also, only at the end of the book did I really understand the title of the book. A decade ago I sat in a lodge overlooking a river in the Venezuelan jungle. A large tree full of chattering parrots provided shelter while I read Love in the Time of Cholera for the first time. This book was on my fourteen year old grandson’s summer reading list!! He and the rest of our group was out climbing a mountain to reach one of the magnificent waterfalls in the area. 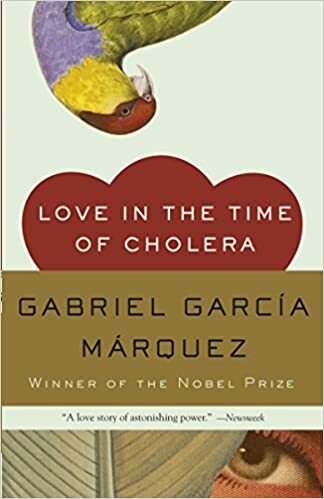 Although Garcia Marquez is a Noble Prize for Literature, and this book is a masterpiece, anyone who has read this book will question how this book could have been included in a reading list for a teenager. I reread this book as part of a Lifelong Learning course during which we read a large portion of the author’s work. Love in the Time of Cholera is the most enjoyable, readable, of his work. There is also a Good Film that follows the story very closely. Basically, the story is about a Latino man who falls in love. The girl is very haughty, bad-tempered and Beautiful. At first she encourages his attentions, but then inexplicably shuts him out and marries a doctor from a rich, prominent family.. he lives his life, waiting for her husband to die. Some readers may be shocked at the way the author includes detailed accounts of the man’s 57 years of sexual activity with a variety of women, including his young, 13, ward. This stunning work captures the feelings of love and tragedy all in one. Of course, the author is very famous for this and other works. Be ready for a dark road down a very interesting path as the years go by in the lives of the two main characters. There is a little funny business about his sexual exploits but I don’t want to give away the special way he worded things. Gotta read it!